Podcasts are among the most popular form of communication on the web, often providing a representation of websites in audio form (although many radio shows are also available in this format). The common format of a podcast is the introduction/topics for discussion rundown/name check any guests/start talking pattern, which can lead such recordings to last anything from 15 minutes to a couple of hours, depending on the depth and breadth of the subject at hand. Previously you might have seen that it is possible to automate the downloading of podcasts with your Zune desktop player. However, what happens if you’re away from home for any period of time? 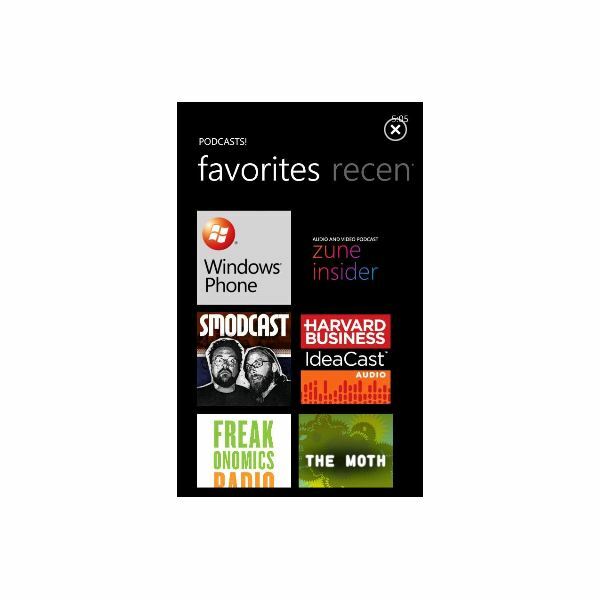 How would you listen to a podcast on your Windows Phone without Zune to download and sync? The answer comes, of course, in the shape of an app. Podcasts! is available from the Windows Phone 7 Marketplace as a free download, and can be used to find, download and enjoy podcasts on your Windows Phone. Using both 3G and Wi-Fi connections, Podcasts! will allow you to enjoy not only audio podcasts but also video podcasts, making this a very useful multimedia tool for Windows Phone. Installation shouldn’t take too long – if you’re having trouble finding the app in the Marketplace, either use your Zune desktop client to find the app or use the Marketplace search function. After installation the Podcasts! app will be available in the Windows Phone 7 programs menu. 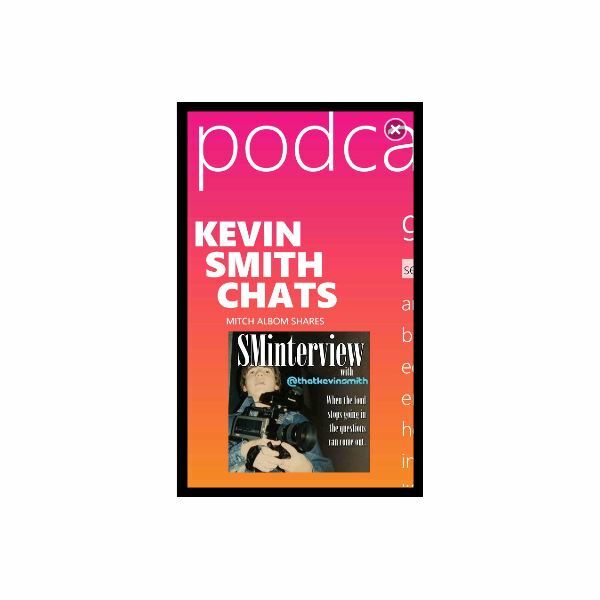 The first thing you will see is a link to the current “sponsored” podcast – by swiping left and right you will see a list of genres to choose from, as well as be able to search for podcasts. Additionally there are tools for viewing a list of recent podcasts, favourites and the ability to manually add shows you want to listen to (by entering the URL into the Add podcast screen). Browsing the genres is easy – simply pick one and scroll up and down to find something that you want to listen to. If Video podcasts are also listed, simply swipe left to view these. When you select a podcast, you will be presented with an overview of the subject matter as well as a list of available episodes. 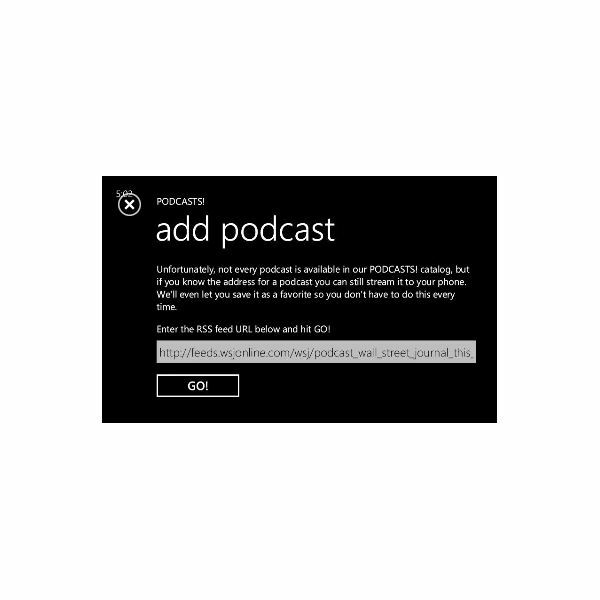 On the menu at the foot of the display you will be able to Add to favs or Share the podcast, and by tapping the Play button next to each entry in the Episodes tab you will prompt the podcast to begin downloading to your Windows Phone. This can be listened to live even over a 3G connection, although for best results a Wi-Fi connection is recommended. The podcast player features a standard play/pause button, forward and back buttons as well as a Restart button; additionally the player screen will display the “cover” of the podcast you’re listening to. Note that the podcasts will not be added to the Podcast list in the Music & Videos Hub – they will only be available via the Podcasts! app. All references and screenshots: Podcasts! app for Windows Phone.